IGPX is an interesting anime because the premise if unique. In the future, people race with robots of immense speed and power instead of with cars. When you’re inside of the robot, you are able to do things that would be impossible if you were outside. Communication between animals and humans is made possible among many other things. Can a racing series really be a lot of fun, or will it get old after a while? Well that’s the premise and that’s basically the plot as well. I’ll elaborate a little more since there is some more plot in the show. Team Satomi consists of Takeshi, Liz, Amy, and River. Their team has finally made it to the IG 1. This is essentially the equivalent of going from a College Football Team to the National Football League level. They’re excited, but also terrified at the same time….can they win? The show revolves around them as they test their mettle against many different teams. There is deception, betrayal, and epicness as the season goes underway. Season 2’s plot is essentially the same as season one’s, but with a few new wrinkles. This time, Team Satomi has proven that they are seasoned veterans, but a new team has jumped into the mix. These rookies really look up to Team Satomi, but there seems to be something shady about them. Are they really on the level? Team Satomi starts to have a lot of trouble with their mechs and they’re put into a very dangerous position. Friendships start to go awry and the team may fall apart at the seams! The plot is very basic, which can be a good or bad thing. This means that their is more pressure on the animation, pacing, and characters than usual. The soundtrack is pretty good and there are a couple of catchy themes. This may not be 5 star material, but it’s still an above average array of songs. How about the animation and the pacing? Well, the animation is good, although it’s nothing special. The robot fight scenes are fun to watch, but the human parts look really low budget for the most part. It could be that most of the other shows that I’ve been watching have far superior animation (Digimon, Soul Eater, One Piece, etc) but I think that the show could have done a little better in that regard. Some scenes just feel very dated. That being said, the robot fight scenes do hold up pretty well for the big battles. The pacing can be a little off at times, but it’s decent. The only times where it hurts are when we go for a long time without a fight. The problem with the characters is that their social lives aren’t interesting. Whenever the characters are not in their mechs, they become uninteresting. There are some exceptions to this, mainly thanks to Takeshi and Cunningham. Still, the exceptions are few and far apart, while the other human scenes can get very dramatic. Takeshi is the main character of the series and he’s very unique. It’s hard to get a read on the character as he’s constantly changing. He’s different from the average main character as he’ll hype up his teammates a lot and give speeches when they win battles. He also acts like a hothead once in a while and also loses his cool quite a few times. He gets into more than one romance through the series and all of them were very forced. One episode he would be awesome and then he would look awful in the next one. By the end of the series, I would say that he’s a decent main character, but he isn’t higher than that because of all of his missteps. His robot skills are pretty good and he can fight in hand to hand combat which is always a plus. Liz is also good at hand to hand and she’s one of the main three pilots for Team Satomi. She was my least favorite character from the three and her character development was never that interesting. We learn things about her past and she enters a contest at one point, but they all felt like filler in the end. She always talked a really good game, but then she would be a non factor in the actual races. Amy is a much better character and she battles alongside her cat. Her cat is the brains of the group and helps them out of many tight jams. Amy is a decent racer and she showed a lot of potential, but the show never really got to give her the spotlight. She gets a smaller role than Takeshi and Liz, but she still wins when it counts. What she lacks in skill, she makes up for in heart and determination. We have the supporting cast as well and I’ll go into several of those character. We have the Coach, who gets a pretty big plot twist towards the second half of the series. It’s a cool twist, but his back story is fairly uninteresting and could have been handled better. Needless to say, he does know what he’s talking about and he has a good grasp of the sport. We’ve also got the technicians and the head of the team. There are troubles getting sponsors for a while, but it’s hard to sympathize with them. Fantine is the leader of Skylark and she’s a bit of a main character for a while. She ends up dating one of the main characters, (Gee, I wonder who…) but it’s a very forced romance. I won’t say if it continues for long, but those scenes could have definitely been left out. As far as racing goes, I never found her that impressive. We’ve also got River, who is one of Takeshi’s rivals. He’s all right, but not very impressive either. All he wants is to play IGPX and defeat Takeshi, but that’s just not enough. Unless he develops some news skills, that will basically be an impossible dream. The Rocket is also a racer who is legendary. He’s not currently in the league anymore, but back in his day…he was the very best! He’s a pretty impressive racer and he proves that you can take on superior technology if you have a decent plan. His methods for victory can be a little questionable. Let’s go into the other teams a little bit. Team Velshtein is Satomi’s mortal enemy and it’s all because of Cunningham. Cunningham is an elite racer and I’d say that he’s easily the best character in the series. He’s better than Takeshi in hand to hand combat and no one is a better pilot. He battles with Takeshi many times and I’d say that it’s clear who the better pilot is. His mecha also looks really cool and his speed is leagues ahead of the other racers. We’ve also got Team Sledge Mamma. They’re a bit of a joke to put it mildly. The show actually takes them seriously, but I would say that they’re easily one of the weaker teams. Their roster is beefed up when they get a new member, but they never really looked good. Their mecha designs are all right, but their gimmicks aren’t that cool. All in all, IGPX was a pretty fun series. It’s not going to go down as one of the all time greats, but it’s a solid watch. There isn’t too much emotional baggage or complicated plots so it’s an easy anime to just pop in the dvd player and just watch a few episodes. The fights are solid and while the human interactions may not be that great, Cunningham’s scenes are pretty awesome. 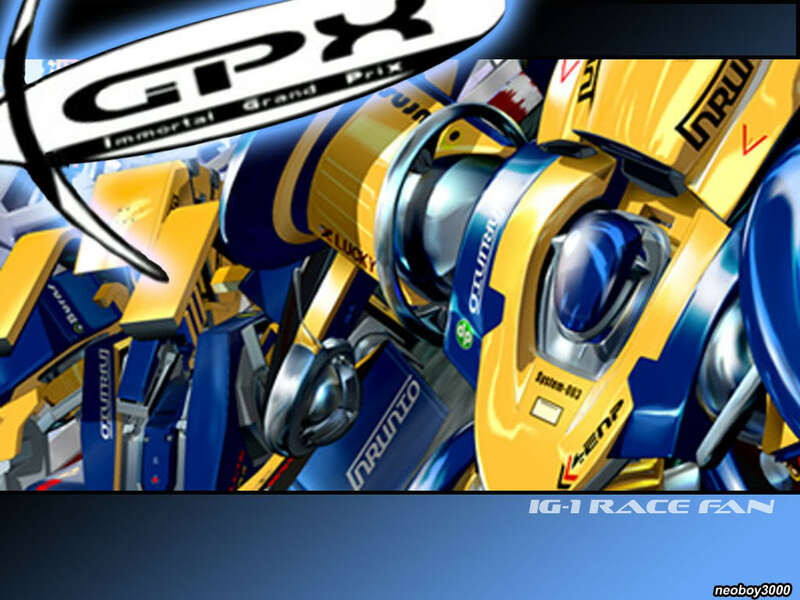 I’d recommend watching this anime if you like racing or mecha battles since it has both. The final episodes even feature an aerial battle that’s pretty intense and not even of this world! This entry was posted in 7 Star TV Shows, Reviews, TV Show Reviews, TV Shows by dreager1. Bookmark the permalink.